As one of the largest sports equipments manufacturers in China, Double Fish majors in producing equipments for table tennis, badminton and other kinds of sports equipments. Double Fish is a well-established brand and has a long history. Its table tennis ball has been approved by the ITTF for use in international competitions since 1979. Double Fish has its unique view point on the study of materials and formula, making technique, the mutual influence between table tennis and motor function. 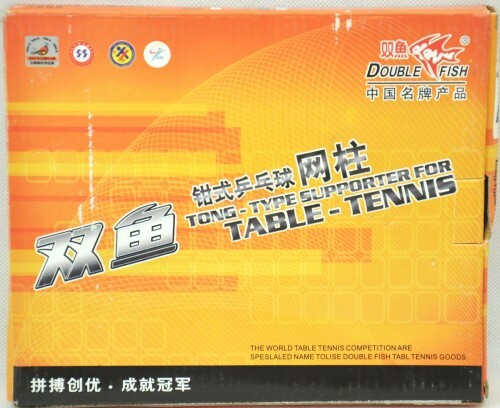 Double Fish makes constant efforts to offer the technical support to the development of world table tennis sport. Double Fish Clip post set is ideal for school and leisure centre use. It has a strong metal post with "clip on" fixing system and the clamps are covered with rubber protectors to avoid damage to table. We adopt high quality steel to manufacture table tennis net post, meanwhile we select the latest popular pliers type design in the world to produce our net post. As a result, the post should be convenient to use and the quality is reliable.